Taking the NNAAP? We can Help! Everything you Need! Free practice questions, exam registration information, Test Preparation Tips and Strategies, plus practice test questions in every format – APPLE APPs, PDF download, Kindle, ebook and iBooks. The test has two parts, oral and written. Both exams are written on the same day, and candidates are expected to pass both to be listed in the Nurse Aide Registry. The written portion is made up of 70 multiple-choice questions. The questions are usually in English. The oral exams are for those who cannot read English, and it is made up of 60 multiple-choice questions and 10 reading questions. The oral exams must be requested on application. The second test is called the Skill Evaluation. Here, candidates are asked to perform 5 randomly selected nurse’s aid skills, rated by a nurse evaluator. 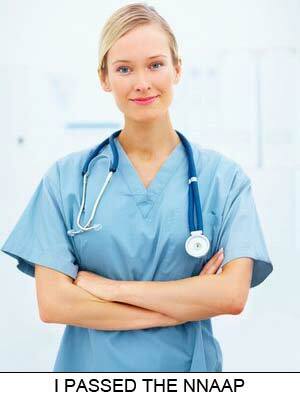 The candidates must successfully perform all five skills in order to achieve Nurse Aide certification. Candidates must submit a criminal background check through the Department of Education. Candidates must have completed a nurse-aid training program within the last 24 months, be approved by the Department of Education and must be a student nurse with an approved application of eligibility from the relevant authorities. Candidates whose nurse aid registration has lapsed must re-test, as well as those certified in other states. To register, ask your employer for registration materials, or through your school or the Red Cross. The fees for registration for both board exams are $102 and $112 for written and oral exams respectively. The retest exams fees are, $41 fee written exams only, $61 for the skills evaluation and $51 for Oral examination only. Once the Red Cross receives the registration form, documents and fees, the test date is scheduled in a confirmation letter issued two to five business days after the required materials are received. 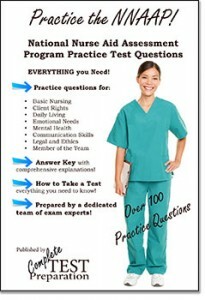 National Nurse Aide Assessment Program practice test questions. Includes basic nursing, daily duties with patients, patient rights, communication skills, and patient emotional needs. Published By, Complete Test Preparation Inc.